Adobe Flash is everywhere, animations, presentations, games and etc. All the web browser support flash plugin which enable user to view and enjoy the rich media content delivered by interactive Flash embedded pages. But that gonna happen only when u are online and through browser. How about if u want to keep the file, in order to play it offline, transfer to hand phones, include in your presentation slide and etc? Flash animation files are embedded as SWF (Small Web Format) files in webpages. Rather than depending on any software or a third-party website, downloading Flash content can be very simple. 1. Fire up Firefox and browse to the page which contains the embedded SWF Flash file that you are eyeing to download. Let the SWF file stream through once completely. 2. 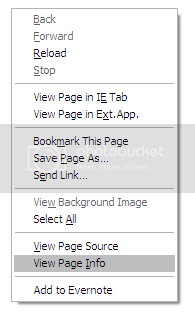 On any empty part of the page, right-click and select the Page Info context menu option. Or alternatively, go to Tools Page Info. 3. Select the Media tab. The Media tab lists all image formats, icons, style sheets and flash files that were rendered by the webpage. 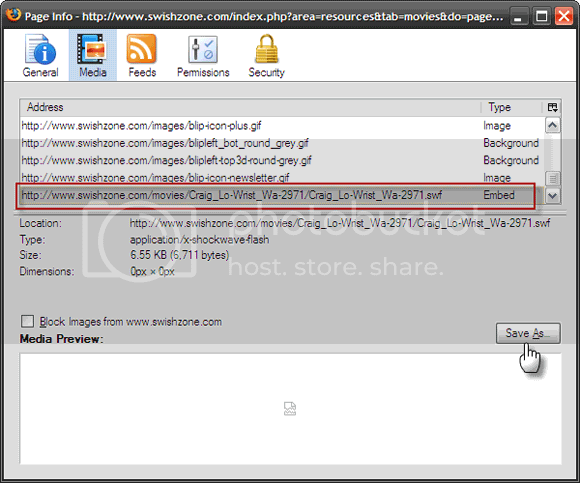 4.Look amongst the items to find the particular file with the SWF extension. The type column will show up with an Embed filetype. Highlight the file and click Save as to save the file on your hard drive. Kindly visit below link for different browser such as Internet Explorer & Opera.